Usually when planing a menu or meal, I try to take Bob’s likes and dislikes into consideration. I try to cook things that I think he will like and avoid things he doesn’t. I try to make things spicy and filling and avoid couscous and peppers since I know he isn’t a fan of them. I try to limit my vegetarian experiments and cook chicken more than pork. I try. Bur occasionally I make something that sounds great to me and right up my alley and poor Bob has to deal. Tonight was one of those meals. 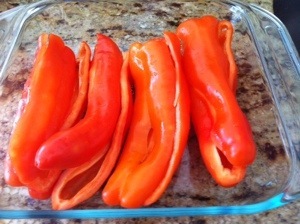 I love sweet red peppers and the farmer’s market had some adorable ones this weekend. I tried to find something else for Bob, but just couldn’t find anything that looked great. So sweet peppers it was. 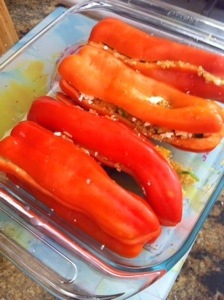 I sliced open and seeded the peppers then chopped some veggies I had on hand. Tomatoes, zucchini got mixed with quinoa for the filling. I tried to make sure I spiced it well using saffron, coriander and a little salt and pepper. At least that is what I think I did, I’m actually not positive about the spices. 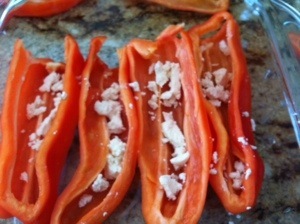 I let that cook just a little then crumbled some goat cheese in the bottom of the peppers. 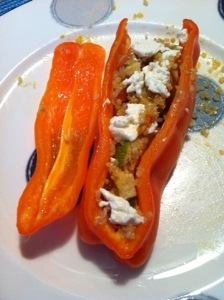 I added the filling to each pepper then replaced the top after adding a little more goat cheese. I baked these at 325 for about 40 minutes and the results … Mixed. I loved these. Subtle spices and a nice texture with the sweetness of the pepper. Bob thought they were ok, but not great. Mind you, he liked them well enough to eat two, but he wasn’t nearly as happy as I was with these. I’m hoping tomorrow’s experiment is better – butternut squash with chickpea stuffing. Total experiment and I’m making my own recipe for the so we shall see how it goes.